Painting books – When you think of these you automatically think “artist type books” like watercolor painting. Whether someone would consider a house painter an artist or not would probably be contingent on how good of a craftsman they are. But as a painter and a craftsman I do have several books available to help new painters develop their technique and style as well as run their business profitably. Two of them listed below are for estimating and advertising a painting business and has on-the-job color photos to help you be more efficient and tun your jobs faster. One is a more artistic book or course. 1. 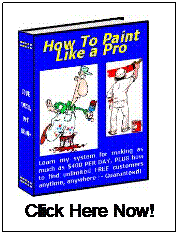 Paint Like a Pro – a complete manual for painters on estimating and advertising. It also has a bonus drywall and plaster repair manual that shows how to make $30 - $70/hr doing small, easy-to-do repair jobs on the side. 2. Bid Like a Pro – the same as Paint Like a Pro only with a different title. It is aimed toward painters who are experienced but are tired of eating their paint jobs and want to discover how to estimate with accuracy. 3. 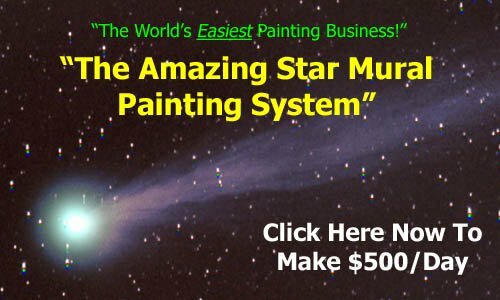 Sci-fi Ceilings® - “The Amazing Star Mural Painting System” – this course shows you all the tricks for making awesome star murals plus how to get jobs and how to price each work. These manuals come complete with color photos showing various painting techniques as well as everything else needed to make money. A new artist or painter cannot go wrong by getting the right information needed to run a painting business right from the start. The amazing star mural course is a real steal at the special limited-time offer price. It is a perfect way to make $30 - $70/hr in the painting market. Enjoy this article about painting books? Go here for more handy tips.